Over Thanks giving weekend Flor and I put some miles on the car. first we drove to LA to have dinner with her family and then I drove back to San Diego. On Saturday I drove back to LA to join Flor for our wedding shower and then drove to Fresno to be with my parents for Sunday. My mom came down for the shower also so Flor sat with her in her car for the ride and during this three hour drive by myself I finished up my latest King novel in the car: The Drawing of the Three. 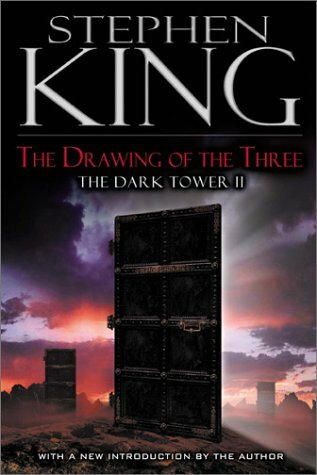 This is the second book in King's Dark Tower series and though I read this book in my high school years I was amazed to reread it again as I didn't remember much detail from it. The end of the book was far more intense than I remembered it being also. Frankly this was a three hour drive that flew by! I was into the story more than I had been into one in a long time. It was great. The Drawing starts off hours after The Gunslinger ends. Roland is dying of infection and he has to gather three people from another world through magic portals that only he can control. These three are his path to the Dark Tower. Amazingly, the entire book does not ever leave this premise and at the end of the book he's still on the same beach though a different section of the beach and he's still fighting infection and death except now he has drawn three "companions" or "helpers" for his quest and the reader is thoroughly sucked into the journey. An interesting tie-in to The Gunslinger is in the third portal that Roland enters he enters the mind and body of the man responsible for killing Jake, the boy Roland meets at the weigh station in The Gunslinger. Jake died but somehow found himself in Roland's world after his death. Later in that book Roland sacrifices Jake and allows him to fall to his death for at least a second time. Jake tells Roland there are other world than this and he's correct in King's imagination.